This book brings together for the first time a synthesis of philosophical and psychological material to examine the basis for the professional identity that teachers might believe in, and the effects of misunderstanding and mistreating these beliefs. By critically synthesising findings from a range of sources, the book provides a rationale that argues an essential ingredient of good education is the quality of teachers who have a reaffirmed sense of creativity, autonomy and agency. The book presents a role for educational　psychology in informing educational and inclusive processes, filling a longstanding need for a text that delineates the way psychological phenomena underpin education. Beginning by considering notions of ‘self’ and ‘identity’, the book explores the relationship between our identity as defined by ourselves, but also as defined by others in the social and professional　groups we may or may not be considered as being part of. It looks critically at how the erosion of the professional identity of teachers has affected education, and considers the morality of ‘othering’ ‘others’ and its damaging effect on teachers and　young people. Gibbs reflects on the organisational structure and leadership of schools, the psychology of these institutions, and the barriers that need to be overcome in order to promote greater inclusivity within them. Offering a careful and insightful look at the psychology behind education and teaching, this is an essential read for　teacher educators, researchers and academics in the field of education and will appeal to policy makers, teachers and educational psychologists. "Simon Gibbs has written a compelling and timely account of the UK teaching profession. With teacher recruitment numbers falling and many teachers leaving the profession, this book is certainly a welcome addition to the growing number of works exploring the impact of so-called neo-liberal ideologies on the role of teachers." Reviewed by Marc Smith, who is a Chartered Psychologist and teacher, in The Psychologist, September 2018. "This is a book that I think will stimulate and inspire some […] and will provide succour to some who share the author’s concerns about the culture of “performativity” eroding the nature of professional relationships amongst teachers and schools. [It is recommended for] those who have an underlying interest in the broader moral and ethical purposes of education and may be concerned about the current practices within the English education system (possibly the majority of EPs), but also others in the education sphere who may have an interest in these issues." Reviewed by John Price, Senior Educational Psychologist, Thurrock Educational Psychology Service, in Educational Psychology in Practice. 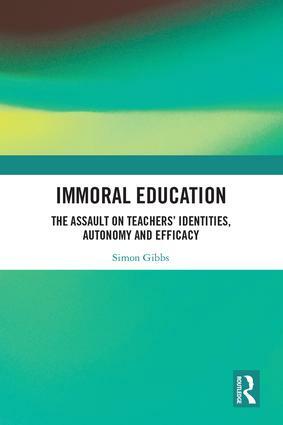 Simon Gibbs has written an excellent book which shows us just how the best teachers have a sense of creativity, autonomy and agency, and yet how the current educational regime destroys teachers’ professional identity and autonomy. These are messages that those favouring a humanistic approach to education and learning will strongly support; and it’s very heartening to this reader that there are ever-more authoritative voices like those of Gibbs being raised that fearlessly name the madnesses of the current system, and advocate the kinds of changes that will be necessary if we are to create a truly human(e) education system fit for the 21st century. Reviewed by Richard House, Chartered Psychologist and author in AHP Magazine, Winter 2018/19. Simon Gibbs is Reader in Educational Psychology at Newcastle University.